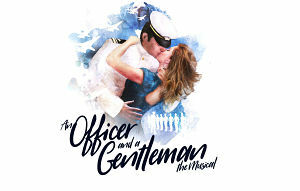 This April is the UK premiere of An Officer and a Gentleman musical based on the 1982 Oscar winning film starring Richard Gere and Debra Winger. Its soundtrack includes the hit song from the movie Up Where We Belong along with 80s classic anthems including Girls Just Want to Have Fun, Material Girl, The Final Countdown, Take on Me, Don’t Cry Out Loud , If You Believe in Love and Alone. Zack Mayo is in training to complete his work at a Navy Flight school to become an aviator, with the help of a tough gunnery sergeant and his new girlfriend. When he rolls into boot camp with a bit too much of a swagger, Marine Corps Drill Sergeant Emil Foley doesn’t make life easy for him. When he falls for local girl Paula Pokrifki and his close friend commits suicide, Zack realises the importance of love and friendship and finds the courage to be himself and win the heart of the woman he loves. It’s only then he can truly become an Officer and a Gentleman. This romantic musical celebrates triumph over adversity and features one of the most iconic romantic scenes ever portrayed on screen. The leads are Emma Williams/Paula Pokrifiki, Jonny Fines/Zack Mayo, Ray Shell /Foley, Ian Macintosh/Sid Worley and Jessica Daley as Lynette Pomeroy.The cast also includes Keisha Atwell as Casey Seegar, Andy Barke as Louis Perryman, Darren Bennett as Bryon Mayo, James Darch as Troy, Nathanael Landskroner as Craig, George Ioannides as Eduardo Cortez, Joe Maxwell as Fin Hooper, Corinna Powlesland as Aunt Bunny and Rachel Stanley as Esther Pokrifki. Joining them will be David Burrows, Vanessa Fisher, Aimee Hodnett, Keiran McGinn and Rhys Whitfield.